The article entitled “Environmental conflict between internally displaced persons and host communities in Iraq”, published online, has been retracted due to evidence of extensive plagiarism. Arguments, data and discussion were reproduced directly from a previously published article: “Environmental conflict between refugees and host communities”, published in the Journal of Peace Research, 42(3):329-46. 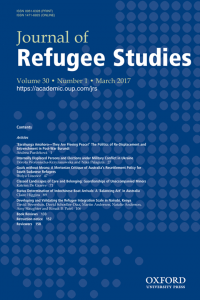 Readers are encouraged to refer to this article instead of the retracted item, which will not now be included in the print version of the Journal of Refugee Studies. We apologise to readers and to the author of the previously published article for this very serious oversight. “Environmental Conflict between Internally Displaced Persons and Host Communities in Iraq” has not been cited, according to Clarivate Analytics’ Web of Science. How did the plagiarism go unnoticed by five different journals? The editorial office received notice regarding the similarity between the version published in DMPHP journal and Earthquake Engineering and Structural Dynamics and took appropriate action and prepared a retraction notice. As the journal was transitioning between vendors during the review and publication process the plagiarism software was not active at the time, hence the oversight. This happened early after I started my editorship. At that time, as it turned out, the publisher did not do a standard plagiarism check on every incoming manuscript. Frankly, I had simply assumed that such checks were in place, since they are indispensable – as this case again proved. As a direct result of the incident, my co-editor and I insisted on a such checks being put in place. Now we receive a plagiarism check for every manuscript and it is impossible that anything like this could happen again. I was alerted by an editor from another journal, who had received the same paper. I then got in touch with Kubilay Kaptan to ask for clarification. He claimed that he was the victim of a personal smear campaign, which involved submitting plagiarised manuscripts in his name. A careful analysis of the paper entitled “Towards a Descriptive Model of Humanitarian Assistance in Complex Emergencies” published online has led to the conclusion that this contribution shows extensive similarities with another paper authored by Georg Frerks and Dorothea Hilhorst entitled “Evaluation of Humanitarian Assistance in Emergency Situations” published in 2002 as UNHCR Working Paper No. 56. Large sections of the text were reproduced without any form of authorization. The author listed had no involvement with this article and was never consulted prior to its publication. Given the duplication of content described above, the Voluntas article in question is being retracted at the request of the editors. We apologize to the readers that this was not detected during the submission and review process. “Towards a Descriptive Model of Humanitarian Assistance in Complex Emergencies” has not yet been indexed. The Editor-in-Chief of Social Indicators Research retracts this article (Mar 2016) per the Committee on Publication Ethics (COPE) guidelines on plagiarism, due to unattributed use of substantial portions of text from the following article, by Dewilde, Individual and institutional determinants of multidimensional poverty: A European comparison (Social Indicators Research 2008; 86:233–256; Springer, DOI: 10.1007/s11205-007-9106-6). The Editor-in-Chief takes issues of research and publication misconduct seriously in order to preserve the integrity of the academic record. Our apologies are extended to the readers that this issue was not discovered before publication. The 2016 article, “Probability of Being ‘Multidimensional’ Poor,” published in Social Indicators Research, has not yet been indexed. “Role of Methodology in Action Research,” published online in the Journal of Philosophy of Education in 2016, also has not yet been indexed. The article, “An organizational metamodel for hospital emergency departments” has been retracted having been informed that it includes significant parts of text taken from an article previously published in Earthquake Engineering and Structural Dynamics. This decision is also based on the guidelines issued by the Committee on Publication Ethics (COPE). The author did not respond adequately to enquiries regarding this matter. The Society for Disaster Medicine and Public Health, Inc. and the publisher apologize for any inconvenience this might cause. “An organizational metamodel for hospital emergency departments,” published in 2014, has not been cited. How is this possible? By whom, why, when, how? Retraction of five papers due to plagiarism is a serious issue, the accused author must come forward and clarify the issues. What he claims might be correct, while seems funny. Is this case an isolated one in that “university”, or a routine tactic of publishing papers by faculties? Who were the editors and peer-reviewers that evaluated and accepted these five papers with such serious problems? Either the author is being truthful in his claim that he was “the victim of a personal smear campaign, which involved submitting plagiarized manuscripts in his name.” This would be regrettable and a very worrying new type of scientific sabotage and character assassination. I would be interested to know if/when/where such an incident has been reported before. On the other hand, this could be an extreme case of self-plagiarism. However, if this plagiarism rose to the level of being “extensive,” “significant,” “substantial” and “…simply a direct copy from an existing one”, then this would be unfortunate. In this day and age, it is only a matter of time before one gets caught out. Either way, retraction is unavoidable. Occam’s Razor says the “my academic rival did it” is likely an excuse. There are easier and more effective ways to ruins someone’s life than submitting plagiarised papers in their name. Especially in a country where expressing the wrong political opinion in public gets you whisked into jail. Time will tell what the real story is, but you’re right: it seems likely a new type of excuse. I thought the trend was toward retroactively claiming whistle blower status. This is nearly as bad. In either case, I agree that there are easier ways to “get” someone than claiming they committed some sort of science misconduct or arranging phony plagiarism. On a number of “Kaptan’s” retracted papers, his email address was listed as k***k***@gmail.com. The same address was linked to Kaptan as early as 2011. The retracted papers are listed on what appears to be Kaplan’s own CV. Doesn’t really support Kaplan’s “a rival did it” theory.